Arrange the Totinos™ on a baking sheet, leaving 1/2 inch of space between each pizza roll. Bake for 12 minutes. Let rest for about 5 minutes. Cut each Totino’s™ pizza roll in 4 pieces. Sprinkle the bottom of individual pans or ramekins with some of the shredded cheese. Cover with a layer of Totino’s™ (approximately 6 pieces per dish) and 2 or 3 pieces of fresh basil. Add another layer of cheese, pizza rolls and basil, ending with a final layer of cheese. Repeat this process for each of the 10 molds. Bake for 4-5 minutes or until the cheese has melted. For a vegetarian version of this recipe, use cheese-flavored Totino’s™ pizza rolls. If you prefer, use a large baking dish with long layers of cheese and Totino’s™ in place of the individual dishes or molds. Queso fundido is easy to prepare and an excellent appetizer for parties or family gatherings. It’s so versatile you can combine it with vegetables or meats to create different dishes of varying colors, flavors and textures. In my family, we share a deep interest for everything Italian. We love pizzas, cheese and basil! This passion is what inspired me to create this Italian-style queso fundido. 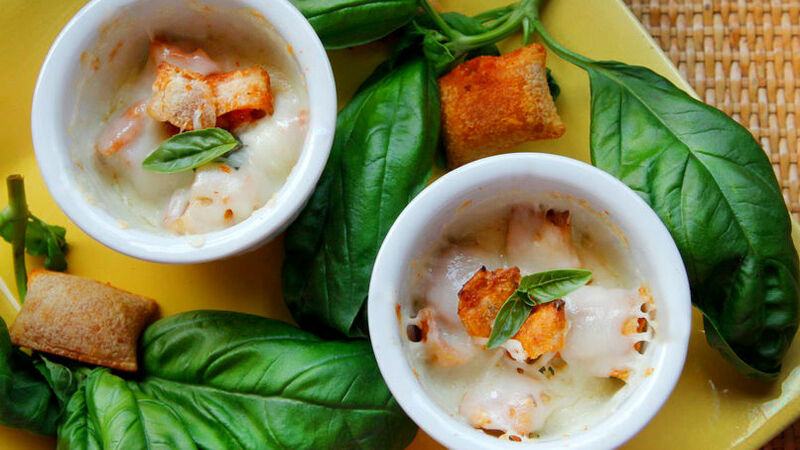 The basil gives it aromatic, fresh flavor and the Totino’s™ interesting texture and a slightly spicy flavor, perfect pairings with the mozzarella. That’s it! You only need 3 ingredients and 45 minutes. Enjoy!